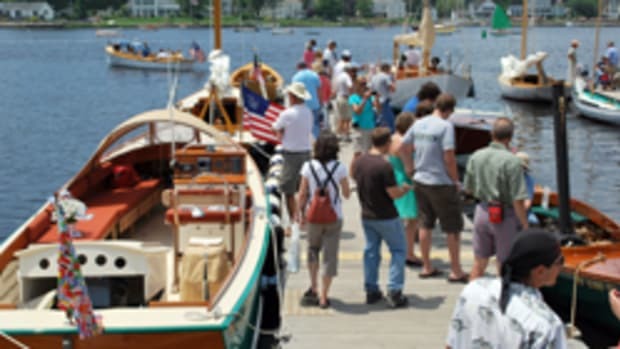 The 20th annual WoodenBoat Show will be held June 24-26 at Mystic Seaport in Southeastern Connecticut. WoodenBoat magazine announced that People’s United Bank, headquartered in Bridgeport, Conn., will sponsor the always popular Family BoatBuilding element this year. Thirteen families completed boats at the 2010 show. To participate, interested families contacted the kit builders and designers whose kits will be featured at the show. The families supply basic tools, energy and enthusiasm for the three-day event. Kits are opened at the show on Friday morning, and tools are put down around 3 p.m. on Sunday, leaving a finished boat, some of which are launched at the show. At the 2011 WoodenBoat Show, more than 30 families are expected to build a variety of boats on the North Lawn of the Mystic Seaport grounds. For information on the boat building element, visit www.familyboatbuilding.com. For information about the WoodenBoat Show, visit www.thewoodenboatshow.com.